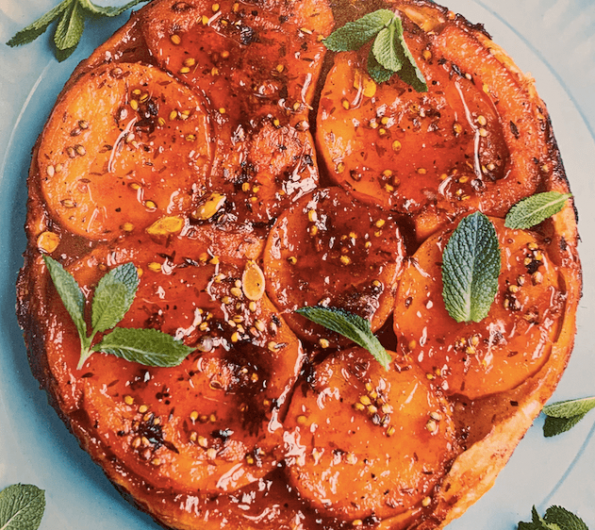 My squash tatin is a delicious twist on the usual sweet one. A tasty vegetarian, lunch time or supper dish that is a little bit sweet but spicy too. a small handful of mint leaves to serve. Put the nice big chunks of butternut squash into a roasting tin, seeds and all. Add the coriander seeds, thyme and 2 tablespoons of the oil, then mix well. Spread out evenly and season with salt and pepper. Roast for 25 minsutes, turning half way through. Meanwhile, put the remaining oil, along with the butter, maple syrup and cumin seeds in an overproof frying pan over a medium heat. Heat, swirling until bubbling, for about a minute, then remove from the heat and add the harissa paste.Arrange the roasted squash slices flat on the base of the frying pan, on top of the mixture. Use all the slices, adding a second layer if necessary. Allow to cool slightly. On a lightly floured surface, roll out the pastry until it is about 4mm (1/4in) thick and large enough to cover the frying pan. Using the rolling pin to pick up the pastry, carefully drape it over the squash, letting the edges over hang the sides of the pan. Trim away all the excess pastry with scissors leaving about 1 cm (1/2in) all the way around, to allow for ‘shrinking’ as it cooks. Tuck the overhanging pastry down between the squash and frying pan. Make a few slits in the pastry to let the steam out. Bake for 30 minutes until brown. Leave to cool for 10 minutes. Place a lipped serving plate upside down over the pastry, then using oven gloves, carefully flip the whole thing over. Remove the pan, replacing any escaped pieces of squash, if needed. Scatter with mint leaves and serve.